Filmmaker Sue Vicory has always been philanthropically minded. In 2014, she established a cause brand called My Power of One, which encourages random acts of kindness. Two years ago, Sue and her husband completed a 48-state tour with the MPO1 brand completing 12 Acts of Kindness which included a glamour day for homeless women in Seattle, a beach cleanup in San Diego, a book collection for books for kids in Milwaukee, a 5K walk in Long Island for kids with cancer and helping kids with special needs in Macon, Georgia. This mission is entirely aligned with The Butterfly Effect’s: Kindness is contagious and small acts, in aggregate, can change the world. 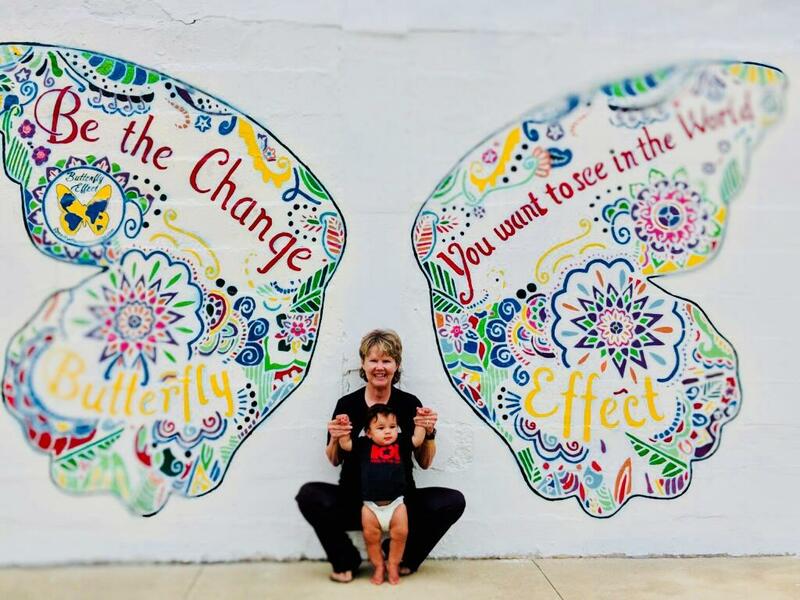 After the big road trip, when Sue got home to her farm in the small rural community of Mound City, Kansas, she realized something: “I just felt this would be a great spot for a butterfly,” she said, and started searching for the perfect wall for a Social Butterfly installation. While having lunch with a friend at one of her town’s two restaurants, called Everybody’s, Sue mentioned she was looking for a wall and that the one outside the restaurant would be perfect. Her friend knew the owner, who happened to be standing nearby. The restaurant’s owner said yes, without hesitation. 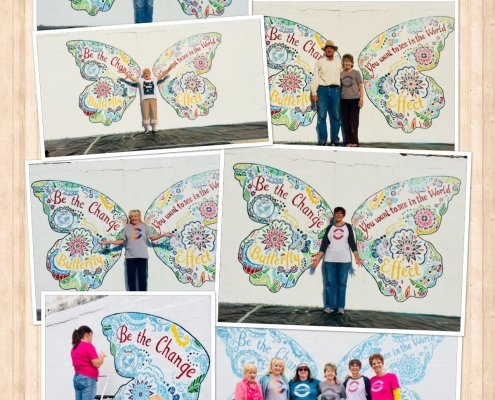 On the designated date in September of 2018, Sue and a dozen volunteers came together and whitewashed the wall, then filmed the installation in stop-motion to document it. “It was just the sweetest timing and the perfect place for the very first wall art in our town,” Sue said. At the end of all the work, they had a beautiful blue, green and yellow butterfly accented with pink, red and purple hues. 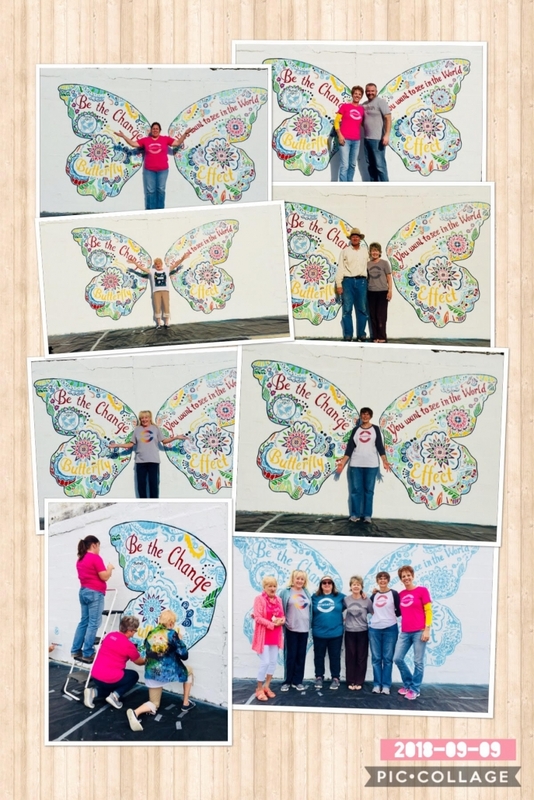 “It’s pretty hard not to notice such a dramatic change in town,” Sue said, adding that the local newspaper took note and wrote a story about the Social Butterfly and the accompanying triple Butterfly Drop. The Butterfly Drop benefitted a dog charity, a breast cancer organization and the local thrift store serving those in need. “I like to be engaged in community-based projects, so it was just the perfect match. No matter where I’d live, that’d be true. I love the idea of a town of 700 in the middle of the universe or the middle of nowhere, depending on how you look at, to have that message,” Sue said.